The Advanced Genie Editor 2, or AGE 2, is a fantastic tool for modding that combines the availabilty and practical interface of the older GeniEd programmes, with the vast options that the previous AGE gave us. It is also a lot more stable than its predecessor; I have yet to experience a single crash, whereas the old AGE crashed every oither time I tried to close it down. AGE 2 is a very powerful tool that allows you to add new units, graphics, sounds, researches and even ages, and to modify pretty much everything in the entire game. The only limitations I have come across are limits presented by hard-coded features o the game, for example, that you can't add all new civilizations. Other than that, AGE 2 is a complete, wonderful tool that allows you to do almost anything you want to the game. Needless to say, AGE 2 is a tool that every modder should have in his or her arsenal. Combined with SLP Editor and DRSExplorer, modding the entire game has never been more simple. 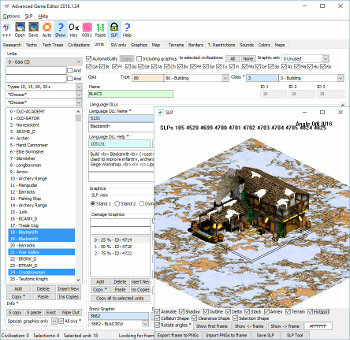 This is my now preferable program to edit age of empires with, It is very much so easier to understand with tool tips and a reference to Genie wiki I'll be looking forward to the coming versions. For looks and for ease of use, for tool tips, more descriptive and understandable fields (even for a newbie). Easily the best modding tool for AoE there is. Everything that's related to each other is stored in the same place so you don't have to look around the whole program to find something to edit. Can edit multiple items at the same time, making multiple Train Time edits, for example, easier to be set at the same value. And there is much more that this tool has to offer. Instructions are to the point and the quality of the product is outstanding.